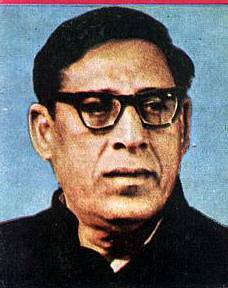 This, my personal web-page, is a tribute to Ustad Amir Khan, one of the most important Hindustani Classical vocalists and a singer I greatly admire. I first heard his voice during a very non-musical exercise, when I was putting together different voices of classical vocalists for a quiz programme. It was a time when Hindustani Classical music was something very alien and distant for me. Coming from South India, more specifically rooted in Karnataka, the only link with Hindustani classical music was Pt Bhimsen Joshi’s renderings of Dasara Padagalu in Kannada. Of course, I had heard about Pt Mallikarjun Mansur, Pt Kumar Gandharva, Pandita Gangubai Hangal, Pt Basavaraj Rajguru, and felt proud that these eminent singers (including Pt Bhimsen Joshi) were from Karnataka. During this voice collection exercise, way back in 1989, I happened to listen to an album (one of the few studio recordings of Ustadji, I learnt later) of his rendering of four ragas, which Prof. T V Hegde, one of the English teachers in our college in Shimoga, graciously lent me. I neither had the time nor the inclination nor the patience to try and understand what the whole thing was about, but somehow the voice and the style stayed with me, not that it haunted me or anything of that sort. Two years of stay in Pune was supposed to have made me imbibe the finer points of Hindustani Classical music, but nothing of that happened. It was in 1994 that I happened to come across the same album by Ustad Amir Khan. I recognized the album by its cover, which somehow managed to remain the same. I was pondering whether to buy it or not, when a friend of mine, very thoughtfully gifted me the album. This time I was really hooked and there was no looking back. Megh and Lalit mesmerized me, but Malkauns was irresistible. Being a student of literature meant that most of the things went to the head via the eyes, and it was mostly by reading. I tried very hard to listen to understand this music. I found out that I did not have the requisite and prescribed patience to sit for a minimum of half an hour (which is the usual duration of a raga on one side of an audio cassette) with total concentration. Without someone telling me ‘what to listen’ to and ‘how to listen’, it was an uphill task. Out of sheer habit, I resorted to reading about this music, and there was ample written material on it. All that ‘pentatonics’ and ‘komals’ and ‘dhaivats’ confused me even more. I put a stop to all this and decided to just listen for enjoyment without trying to bother about the intricacies, and anyway I didn’t want to become a technical expert. I simply became a listener and I enjoy listening to Hindustani classical. Sometimes, though, I envy people who are able to identify ragas instantly. Over these past few years I have unconsciously been trying to make connections between Hindi film songs and the ragas that I have heard. Coming back to Ustad Amir Khan, most of the things that I know about his music are through reading. I have tried to read whatever I have been able to lay my hands on, and of course, the sleeve notes. While listening to Ustadji, I used to feel that his rendering of Vilambit is in extra slow motion. I realized that Ustadji borrowed this style from Ustad Waheed Khan of the Kirana Gharana, who used this style of singing for his riyaz. Ustad Amir Khan brought this style of rendering onto the performing stage. This style of singing is called the Meerkhand or the Khandameeru style. When I read the sleeve notes carefully I saw that most of the Vilambit renderings were in Jhumra Taal (14 beat ryhtymic cycle), which I learnt, because of its ati-vilambit (extra-slow) tempo, suited his singing in the Meerkhand style. But, sometimes the Drut is so fast (especially Malkauns) that you wonder if it is the same person who is singing it. I learnt that the exuberance of his swift taans and electric sargams were influences from Ustad Rajab Ali Khan of Devas and Ustad Aman Ali Khan of Bhendi Bazaar Gharana respectively. This much I learnt from reading about Ustad Amir Khan’s rendering. Ustadji was born in 1912 and had his initial training from his father, Ustad Shamir Khan, a Sarangi player employed in the court of the Maharaja of Indore. Prof Ajit Singh Paintal, a disciple of the Ustad, says that Ustadji did not formally train under an Ustad of any Gharana, and therefore did not wish to identify himself with any Gharana. As mentioned above, he was influenced by Ustads of many Gharanas. Ustadji designated his style as the Indore Gharana, after the name of the city in which he had his initial training and acquired his musical consciousness. In an article in the Indian Express (October 24, 1993) written by Ashish Sharma, we get to know the views of a number of Ustadji’s disciples regarding his music. Did you know that Pandit Gokulatsavji Maharaj modelled his singing on Ustadji’s style by only listening to his recordings and never having met him even once? Even Panditji’s voice is so similar to that of Ustadji’s that AIR had received angry letters from listeners in Pakistan indicating that in a programme featuring Ustad Amir Khan someone else’s name was wrongly announced. It was Pandit Gokulatsavji Maharaj who was singing that day! Panditji says: “It is my misfortune that I could never meet Khan Sahib, but I listened to his recordings over and over again, and tried to emulate the spirit behind his music” (Ashish Sharma, “A Legend and Its Legacy”, Indian Express, October 24, 1993). Ashish Sharma says that Panditji has a mind-boggling collection of Khan Sahib’s recordings, which include even thumris, ghazals and qawwalis besides khayals, which add up to around 3500-4000 hours, with rare ragas like Sarparda, Zurtaba, Kalingra, Lachchasakh, Chayanat, Khem Kalyan! And imagine one man enjoying it all, when we mere mortals have hardly twenty hours of Ustadji’s singing in commercially released recordings! This is all I have to say about Ustadji. I have compiled a detailed discography of the available cassettes of Ustadji’s renderings (at least of what I have been able to collect). I have also scoured the world wide web to bring you Ustadji’s renderings available on the internet, and also some essays and articles on Ustadji as well as on Hindustani Classical music. These articles on Hindustani Classical Music also reflect the way I want to look at Hindustani Music and music itself in general—devoid of hierarchies and itself being subject to many pulls and pressures and influences. è 1989, Original sound recording made by The Gramophone Company of India Ltd. Copyright owner and manufacturer: The Gramophone Company of India Ltd., 5, Old Court House Street, Calcutta 700 001. © 1989, The Gramophone Company of India Ltd., Calcutta. è 1994, Owner manufacturer: The Gramophone Company of India Ltd., 33, Jessore Road, Calcutta 700 028. © 1994. Live recording of an open air concert at Mumbai, one of the last concerts of the maestro; digitally remastered at Sumi Audio Studio, Mumbai, by Ashok Shukla; Recording produced by kind permission of Smt Raisa Begum Amir Khan and with courtesy of Shri R H Bengeri. © & è 1996 Ninaad Music and Marketing Pvt. Ltd., 5/16 Vrindavan, Tarun Bharat society, Andheri (East), Mumbai 400 099. © Navras Records Ltd., February 1998; è Navras Records Ltd., February 1998. Navras Records Ltd., 22 Sherwood Road, London, NW4 1AD U.K.
Navras Records (Pvt.) Ltd., 102 Astron Apartments Behind Mukund Nagar, Andheri (E), Mumbai 400 059, India. Remastered and edited by Pratik Biswas at Digital Sound Studio. © 2001 Original sound recording made by Living Media India Ltd., Registered Office: 9 K Block, Connaught Circus, New Delhi 110 001; è 2001 Living Media India Ltd.
è 1981 Original sound recording made by The Gramophone Co. of India Ltd.; © 1981, The Gramophone Co. of India Ltd.
è/© 1993 Magnasound (India)/Atlantis Music; Manufactured and Marketed in India by Magnasound (India) Pvt. Ltd., Lorette Ville, 25/E, Main Avenue, Santacruz (West), Bombay 400 054, the Exclusive licensee of WEA International Inc., A Warner Communications Company, USA. © & è 2000, Manufactured and marketed by Questionable Ventures Media Pvt. Ltd., 1 New Udyog Mandir, No. 2, Mogul Lane, Mahim, Mumbai 400 016. USTADJI SANG FOR A FEW FILMS TOO! Ustad Amir Khan’s disciples talk about his music.